Earlier this year I worked on a 2 month shoot for Canon, creating new imagery to highlight the capabilities of their lenses and their new flagship camera, the 1DX. With 33 lenses and 7 cameras my studio was overflowing with equipment, and as the first brief was to shoot some winter landscapes we packed it all up, boarded the Caledonian Express and headed up to the Isle of Skye. Skye is a wonderfully scenic place, but after 3 days of grey skies and rain I was beginning to fear the worst for our 5 day shoot. Anyone planning to shoot in Scotland in the middle of the winter needs a bit of luck, and thankfully ours came on day 4. Religiously checking the weather forecast every evening, the next morning looked like it might be clear. 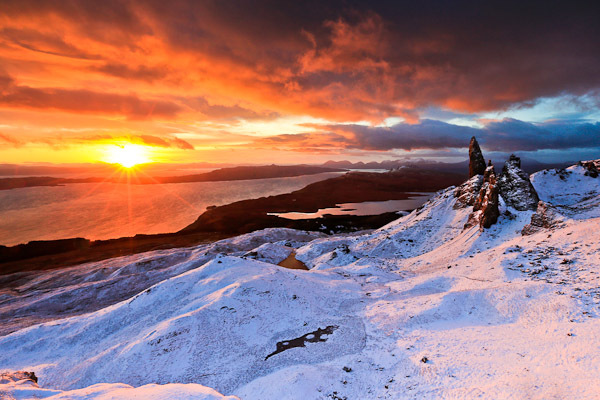 We were up at 5am to start the one hour drive, parked the car and hiked up for another hour through the dark with our head torches on, and arrived on location at the Old Man of Storr just as the horizon started to glow. The cold snap had turned the rain from the day before into a thick coating of snow. The wind was howling a gale and although it was cloudy, there was just enough of a gap in the clouds for the sun to burst through as it came over the horizon, and we were treated to once of the most beautiful sunrises ever. Within half an hour the sun rose into the clouds and the landscape returned to it’s previous dull grey, and by the time we got to Portree to warm up over a hot chocolate it was raining again. Click here to see a few more landscapes from the shoot.